IOS on the Bay: Quiet urban upper East side retreat. Enjoy your solitude in this modern boutique bay side building. Spacious 2BD/2 BA with ample closets & storage space with the latest in kitchen appliances. Balcony view of Biscayne Bay building only has 41 units! 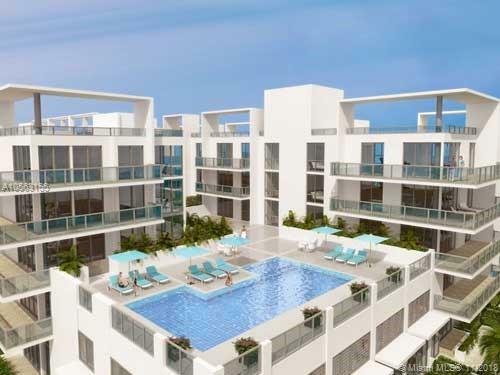 Minutes to Miami Design District, Downtown, Bayside, Brickell and Miami International Airport. IOS on the Bay: Stunning bay view with private rooftop terrace. Beautiful 2 bedrooms 2 baths with European cabinets of rich wood, glass and stain steel, granite kitchen and bathroom countertops. IOS ON THE BAY five floors luxury waterfront condominium. Elegant boutique building located on Biscayne Bay between Morning side and Bay Point. IOS on the Bay: AMAZING WATER VIEW in Upper East side! 2 Bedrooms / 2 Baths unit featuring enormous 800sqf patio!! Unit features high ceilings, open kitchen, stainless steel appliances, electric shades, a master bedroom with his/her custom-made closets and large glass and pebble encased master shower. 2nd Bedroom with custom-made closet done in 2018. 2 parking spaces and storage cage next to the unit. IOS ON THE BAY is a luxury waterfront condominium. Elegant boutique building located on Biscayne Bay between Morningside and Bay Point, nice pool area overlooking the bay and fitness center. Walkable distance to MIMO, Design District and Iron Side. 15 minutes from Miami International Airport. IOS on the Bay: If you love outdoor living, look no further than this penthouse condo that boasts a huge 1000 square foot travertine tile private rooftop terrace, Jacuzzi ready with water and electrical outlets! Enjoy bay and city views from your residence in boutique IOS on the Bay. This residence features modern finishes throughout, including brand new stainless steel appliances, granite counters, 10’ ceilings, travertine marble floors throughout, floor-to-ceiling windows and balcony doors, and an enormous glass and pebble encased master shower. Assigned storage unit. Enjoy a fitness center, large pool overlooking the bay and on-site management. Minutes away from just about everything including the MiMo District’s unique restaurants and retail, Miami Beach, Miami Design District and so much more. One Bay Residences: Unique opportunity to own a brand new, never-before-lived-in townhome at One Bay Residences. Residence #107 is a spacious 2 bedroom + den / 2 bath finished with top-of-the-line Bosch appliances, large impact windows, wood-like tile flooring, and designer finishes. This ground-level residence also boasts an open floor plan with a front porch and a back outdoor patio. Located within a boutique gated community of only 38 townhouses, this residence is perfectly situated in the world renown Design District, just minutes away from Midtown, Miami Beach and all major highways. Community residents can also enjoy a resort-style swimming pool, jacuzzi, and cabanas. IOS on the Bay: TURNKEY & truly exquisite tranquility experienced in this bay-front unit with private elevator entry into the home just above its 2 car reserved parking. Offered turnkey furnished by Roche Bobois, Sacaro, Restoration Hardware and others. 2 balconies and one huge private terrace at pool level. This boutique luxury building is unlike any other and is the often overlooked gem missed by many, situated just North of Morningside and Baypoint. Large swimming pool overlooking the bay adorns the South tower of Ios on the Bay, a tower with only 5 units that come with private elevator entry directly into each respective unit. A private viewing is the best way to fully appreciate this extremely rare and unique offering. One Bay Residences: Best Value! Loft style living the heart of the Design District. ONE BAY Residences, is a gated residential enclave of 30 modern, multi-story luxury townhouses in the Design District. The only modern luxury townhouses in the area that boasts the comfort and privacy of a single-family home with the convenience of condo living. Townhouse features: Double height ceilings, private garage, and 703 sq.ft. private rooftop terrace. European cabinetry & Bosch appliances and quartz counter tops. Walk to Design District, Midtown, or along the water. One Bay Residences: FANNIE MAE APPROVED.READY FOR IMMEDIATE OCCUPANCY. DEVELOPER ONLY REQUIRING 10% DOWN. ONE BAY RESIDENCES, is a gated residential enclave of 38 modern, multi-story luxury townhouses in the Miami Design District. The only modern luxury townhouses in the area that boast the comfort and privacy of a single family home with the convenience of condo living. Townhouse features: Double height ceilings, private garage, & 692 sq. ft private roof top terrace. European cabinetry & Bosch appliances, quartz counter tops. All units will be delivered with floors. Walk to Design District, Midtown, or along the water. One Bay Residences: FANNIE MAE APPROVED.READY FOR IMMEDIATE OCCUPANCY. DEVELOPER ONLY REQUIRING 10% DOWN. ONE BAY RESIDENCES, is a gated residential enclave of 38 modern, multi-story luxury townhouses in the Miami Design District. The only modern luxury townhouses in the area that boast the comfort and privacy of a single family home with the convenience of condo living. This 2/2 + a small den Townhouse features: Double height ceilings, private garage, & 703 sq. ft private roof top terrace. European cabinetry & Bosch appliances, quartz counter tops. All units will be delivered with floors. Walk to Design District, Midtown, or along the water.